For this edition, we will bring a ritual including 4 Brazilian projects that promise to bring something not very popular in the trance scene of the region: the nocturnal strands. Check a little bit about them. Fractal Void is an experimental project that seeks new sound possibilities and materializes in the experimentation of musician Gustavo Siqueira, seeking to harmonize psychedelic, hi-bpms, fullpower basslines and organic timbres. Sifer is the Hitech project of musician Gustavo de Siqueira. The project explores a psychedelic sonority with technological timbres and surrounding melodies to express an energy that transcends everyday experience, providing a unique experience on the dance floor. Noctem Vox is a project that seeks the psychedelic and energy of the high bpm melodically, and innovative syntheses, with a proposal to break paradigms of the scene using references of diverse styles and cultures. With a lot of hitech influence, but looking for a unique, melodic and deep sound ... A lyrical and highly dancing track experience is the goal of the project. Fusion of the Noctem Vox, Coji and Fractal Void projects is a partnership that seeks, through experimentation, to break with labels and provide a unique experience. Mixing different strands like Hi-Tech, Dark-Psy, West Psy and experimental takes it possible to create a psychedelic environment with a lot of energy and depth and then bring a different view of this music scene that grows exponentially. For the first time in Europe, straight from Sao Paulo, Brazil, the party that has been reuniting friends for 10 years with Trance lovers and their strands is set to shake the city of Dublin, Ireland. For those who don’t yet know, Bubonika is always remembered for marking the lives of people with good moments involving friendship, companionship and lots of psychedelic. 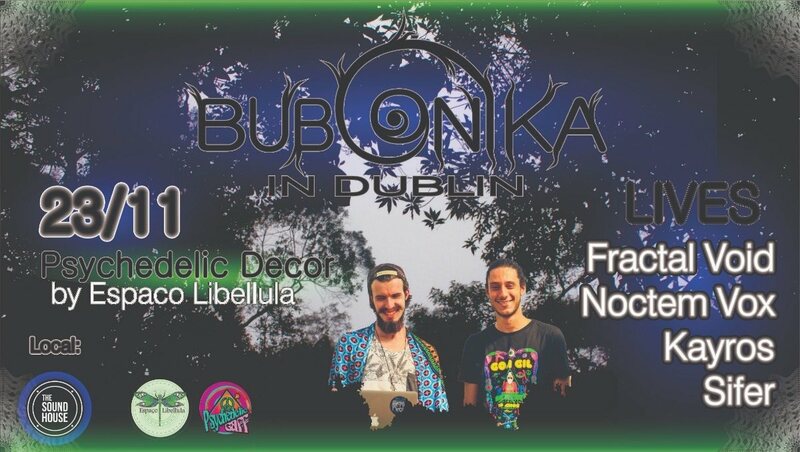 Through the Espaço Libellula crew, Bubonika - this time indoor version - promises to darken the Dublin night. Check out what happened in other editions of Bubonika. send an inbox or email to: espacolibellula@gmail.com.